(1914-2006). Abraham Lopes Cardozo was born in Amsterdam, Holland on September 27, 1914. As the great-grandson of the Chief Rabbi of the Sephardim in Amsterdam (who preached the last sermon in Portuguese, and who was later decorated by the King of Holland), and as the son of Joseph Lopes Cardozo, leader of the boy’s choir of the Spanish and Portuguese Synagogue, it was fitting that he read his first Haftorah at the age of seven in that same synagogue. He attended Seminary Ets Haim in Amsterdam, and became active in Hagomel, a congregational youth society. 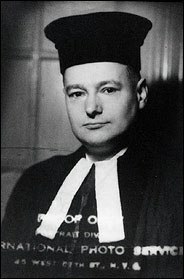 In 1939 he was appointed by Queen Wilhemina to be rabbi of the Sephardic congregation in Paramaribo, capital of Surinam. On vacation in New York in 1945 he visited Congregation Shearith Israel in NYC and he liked it. It was mutual, for he was invited by the Congregation to become the Assistant Hazzan there in 1946, a position he held for forty years. In 1987, he released a book and accompanying cassette tapes entitled: Sephardic Songs of Praise. On June 7, 2000, he was knighted by Queen Beatrix of Holland. (Hazan of Gerona). Writer of devotional hymns; flourished about the middle of the thirteenth century. His piyyutim are found in the Sephardic, the Italian, the Algerian, and even the Karaitic rituals. Best known is his Achot Ketannah, a hymn for New-Year (excerpted from here). Born at Tudela, Navarre (now in Spain) in 1089 and died c. 1167, apparently in Calahorra. He was one of the most distinguished Jewish men of letters and writers of the Middle Ages. Ibn Ezra excelled in philosophy, astronomy/astrology, mathematics, poetry, linguistics, and exegesis; he was called The Wise, The Great and The Admirable Doctor (more at Wikipedia). Rabbi of Spanish-Portuguese Congregation Mikveh Israel, Philadelphia 1955-63, emeritus professor of Hebrew Studies, University of Wisconsin-Milwaukee. Ordained rabbi by Hahám Dr. S. Gaon (London) and by Rabbis Nissim Ezran and Joseph Peretz (Jerusalem). Born on November 4, 1938 in Ouderkerk aan de Amstel, the Netherlands, he was a child survivor of the Holocaust through the altruism of the Van Heukelom family. Dr. Vega was a member and frequent guest Hazzan at the Spanish & Portuguese Congregation Mikveh Israel in Philadelphia. Well-versed in the Spanish & Portuguese liturgy from his upbringing, Dr. Vega made many contributions to the preservation of the nussach, for example, to the Seder Chazzanut Amsterdam, and to this site. (920-990) was a medieval Jewish commentator, poet, and grammarian of the Golden age of Jewish culture in Spain…(more at Wikipedia and the 1906 Jewish Encyclopedia). Hazan of Shearith Israel, New York, between 1839 and his death in 1877. (1873-1972). Hazan of Congregation Mikveh Israel, 1898-1929. Reverend Emeritus until his death. The founder of the Levantine Jews Society of Philadelphia which looked after immigrants from the Ottoman Empire. A founder of Philadelphia Board of Rabbis. His library contained more than 5,000 volumes dating from 1683. Born in Granada about 1055 – 1060, and died after 1138 (more from Wikipedia). An Andalucian Hebrew poet and Jewish philosopher, born in Málaga about 1021; died about 1058 in Valencia. (more from Wikipedia). author of Et Sha’arei Ratson, was a scholar, Rabbi, and liturgical poet from Morocco, who lived in the early part of the twelfth century (more at Wikipedia, translated from Romanian).